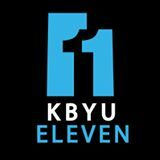 KBYU Eleven is a viewer-supported public television service of BYU Broadcasting and Brigham Young University and broadcasts to the state of Utah and parts of Idaho, Wyoming, and Montana. Nearly 1 million viewers tune in each week for educational, entertaining, and uplifting programs. Have an old car taking up space in your driveway? Donate it to KBYU Eleven! If you have any questions just call one of our friendly operators toll-free at 855-511-1150 seven days a week. © 2016 KBYU Eleven - DONATE NOW. All Rights Reserved.